Jeff Duntemann, CEO of The Coriolis Group that had published my first book, Borland Pascal Insider, asked if I would be interested in writing the first book to be actually published by the Group. (Borland Pascal Insider was published by Wiley & Sons, as would be a second book also sold to them but not yet written, Borland C++ Insider). Well, of course I was! 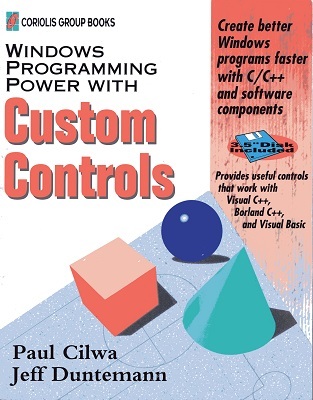 And it was to be quite ambitious: At a time when computer programmers and their books normally specialized in one language, this book was to involve several: The custom controls that were the centerpiece of the book were to be written in C++ (either Microsoft's or Borland's) but the controls themselves would be used in Visual Basic applications. When I got the galley proofs back of the book (the author has that last chance to find any errors/typos and make corrections), I was somewhat surprised to see that Jeff was listed as co-author. I was surprised, because while he had written a very nice forward, he hadn't actually written a word of the book itself. However, he explained that, as a new author, I would find the book would sell better if it included the name of a well-known author, such as himself. And it's true: Of the four technical books I wrote, this was the only best-seller (a relative term that means less for niche books like programming manuals than it does for a romance or young adult novel) among them. Not only was my advance covered, but my next royalty check was even more. And I got a second royalty check, though that one was rather small. Windows Programming Power with Custom Controls came with a floppy disk, on which were provided the sample and example code from the book. Every once in awhile, I get a request from someone who's purchased the book recently (! ), probably used, and found it to be missing the floppy. Few computers even come with floppy disk drives any more; so here is the code in a simple ZIP file.